Single-family homes on the western shoulders of Baldy Mountain allow the opportunity for taking in the sunsets over the Breckenridge Ski Resort. Developed in this millennium, Goldenview homes for sale will be newer construction and situated along Goldenview or South Fuller Place roads to take advantage of stellar views of the Blue River valley, the Continental Divide and the Tenmile Range. Many are on large lots, a few of which are still available homesites. 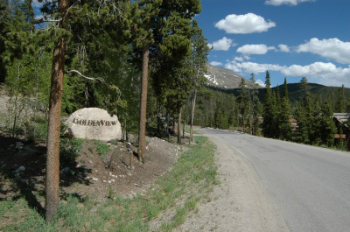 The widely popular trail up Baldy Mountain begins just above Goldenview and borders some of the lots. Either way, a few steps will take any Goldenview resident to this major connector to the national forest. Check out the Goldenview real estate listings below, or keep reading about the sprawling homes for sale in area. Goldenview was developed after adjacent subdivisions on Baldy Mountain and carefully platted to allow good and relatively flat building envelopes. The planning created diverse options of lot size and situation. The terrain is stepped like a movie theater so every one has a view. Below the subdivision are natural land formations that prevent any further development blocking it. Homes built have tended to be oriented to the view with plenty of big log, rough timber or stone elements inside and out. The main trail up Baldy Mountain leads to the Iowa Mill that the last-to-close ore crushing operation in Summit County, and remains a good example of the mining era. From the main trail one can reach the summit of Baldy Mountain or head off on several spurs that connect to Boreas Pass and French Gulch roads. The trail is popular with hikers, mountain bikers and cross country skiers, and a herd of mountain goats, pikas and ptarmigans. Size: 2513 sq. ft. to 5695 sq. ft. Amenities: views, views, views, and easy access to national forest, sunny, newer construction, some large lots, forested setting, near free town bus. From the traffic circle on the north side of Breckenridge, continue on Highway 9 by proceeding on Park Avenue. After 1.5 miles Park Avenue rejoins Main Street at a 3-way stoplight. At the following stoplight turn left on Boreas Pass Road. Continue up Boreas along switchbacks with incredible vies, and take a left on Baldy Mountain Road. This road will travel straight toward the base of Baldy Mountain and switch back near a small parking area for the Baldy Mountain trail. Here take the right fork and Goldenview homes will appear. Are you ready to discuss your real estate opportunities in Goldenview, or any other Breckenridge neighborhood? Contact us today!